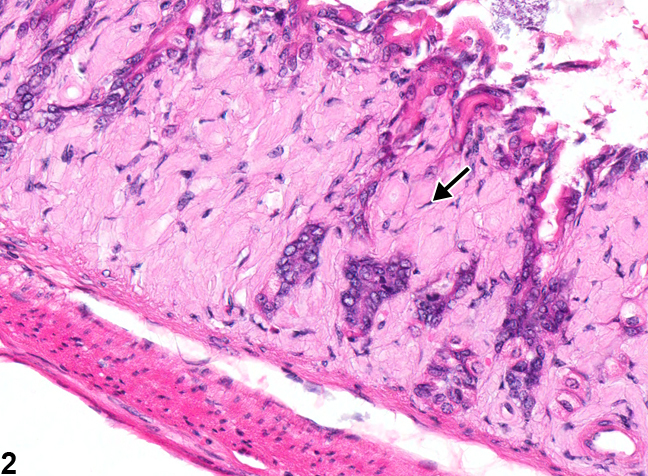 Stomach, Glandular stomach - Amyloid in a female Swiss Webster mouse from a chronic study. 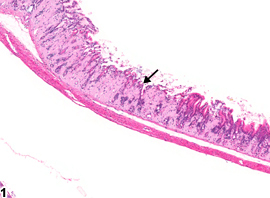 Amyloid (arrow) is deposited in the lamina propria. Stomach, Glandular stomach - Amyloid (arrow) in a female Swiss Webster mouse from a chronic study (higher magnification of Figure 1). The deposition of amyloid in the lamina propria results in the loss of glandular epithelial cells.